Dr. Leonard N. Girardi is a Professor of Cardiothoracic Surgery in the Department of Cardiothoracic Surgery at New York Presbyterian-Weill Cornell Medical Center. He is also an Associate Attending Surgeon at the Memorial-Sloan Kettering Cancer Center. Dr. Girardi completed his undergraduate studies at Harvard University in 1985, obtaining a degree in biochemistry. He pursued his medical education at Cornell University Medical College and completed his residency in general surgery at Cornell Medical College, where he remained as a resident in Cardiothoracic Surgery. Dr. Girardi graduated from the program in 1996 under Dr. O. Wayne Isom. After completion of a fellowship in aortic surgery at Baylor, Dr. Girardi assumed his present position at New York Presbyterian-Weill Cornell Medical Center. 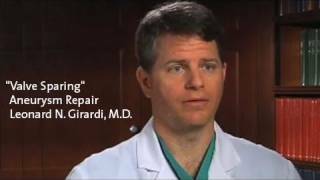 Dr. Girardi is committed to training the next generation of cardiothoracic surgeons and teaches medical students and residents on all levels. He is a member of numerous surgical societies, including the American Association of Thoracic Surgery, Society of Thoracic Surgery, The DeBakey International Surgical Society and the American College of Surgeons. He has published extensively on multiple topics in cardiovascular and aneurysm surgery and has given many lectures at regional and national surgical meetings. Dr. Girardi has four sons, Nicholas, Henry, Edward, and Anthony.